All the good bits of the P90 model but with more versatile dual-humbuckers, a cool colour - and it’s slightly cheaper, too! As to the neck construction, on the Matte Green model and you can clearly see a single-piece heel stack. The headstock is spliced on, but higher than usual, just in-front of the two E string tuners. And don’t forget, Taylor uses a similar three-piece neck construction, as does PRS on its S2 Series and CE 24 and Silver Sky bolt-ons. The lip inside the treble cutaway - slightly thinner than on an original Les Paul Junior - also suggests that most, if not all, of the width of the neck fits into the body. Godin’s headstock proudly displays the country of origin and is another classy, classic design. We’ve criticised Godin before for adding an unnecessary number of brand logos to its instruments. Hey, maybe they listened: there’s just the headstock script logo here. 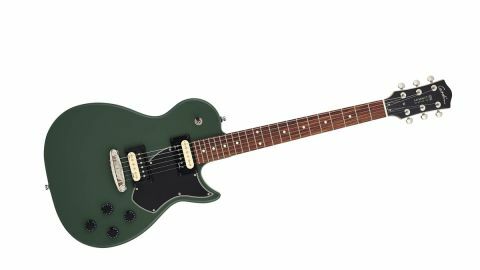 The humbuckers on our Matte Green model are zebra coiled; the Matte Black and Burst versions are covered and sit in conventional rings. Finally, the output jack is the screw-in Tele barrel style. Functional? With a capital F. Sounds Acoustically, there’s a lively but not over-bright or honky response. This guitar doesn’t really need any dialling in. a nicely woody thickness. Yes, there’s bite and a good power from the bridge, but both volume and tone shade very well, and if you run your twin-humbucker/four-control guitars with the tones and the volumes pulled back a little to set your basic sound, this Summit really does become nicely versatile.